Alec Flint is in fourth grade, and he’s a super sleuth…well, maybe he’s a super sleuth-in-training. Nevertheless, he is absolutely certain that he will make a great detective one day. And when better to test his sleuthing skills than after the entire Christopher Columbus exhibit goes missing from the town museum? Alec has a sweatshirt with a convenient pocket, a pen that writes upside down, and most importantly, a detective notebook: He’s all set to go! But can Alec and his new partner Gina, solve this museum mystery before it’s too late? A sweet and appealing tale with oodles of kid-appeal. It made me chuckle while whetting my appetite for mystery. Welcome Alec Flint to the ranks of grade-school sleuths! Santopolo’s prose crackles, and she manages to weave in a fair degree of historical information on Columbus as she spins her yarn (and supplements it with a lengthy Author’s Note). The first in what promises to be a solid middle-grade series in the tradition of Encyclopedia Brown. 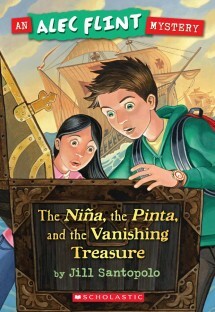 What sets this apart is its lively characters, a thoughtfully derived sprinkling of clues for the kids to pursue, and the opportunity for readers to have as much fun solving the mystery (and decoding the coded messages) as Alec and Gina.